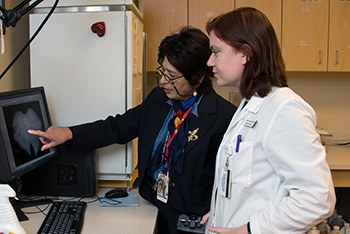 The medical professionals who create and direct the 4th Year selectives and electives are an integral part of the University of Arizona College of Medicine – Phoenix. We greatly value the expertise and enthusiasm of our teaching faculty and want to make you feel a part of our shared mission of educating the next generation of physicians. Thank you for your interest in developing an elective course for the University of Arizona College of Medicine – Phoenix campus. We are excited to continue expanding our elective opportunities for our growing number of students. We welcome new educational experiences and enthusiastic faculty who will contribute to the depth and variety of the educational experience of our 4th-year medical students. Please download the New Elective Welcome Packet to learn more about our elective program and begin to develop a new course for our medical students. If you have questions regarding the new elective submission or approval process, please contact Sara Hillman, assistant director of Clinical Sites and Scheduling, at 602-827-2398. *Please be sure to include how you are affiliated with the College. Our accreditation requires that all elective course directors have a faculty title with the university. Please complete the online volunteer faculty title application if you do not currently have a faculty title. There is an online chat option available during business hours if you have any questions during the application process. Contact the Office of Faculty Affairs and Development for additional information. Syllabi for Electives (PDF), the Core Sub-Internship Selective (PDF) and the Critical Care Selective (PDF) for Academic Year 2017-2018, as well as the Electives Course Director Faculty Survival Guide cover all important information for working with UA students during their elective/selective rotations and provide medical directors with many helpful resources. This should be provided to all personnel working with our students during the rotation.